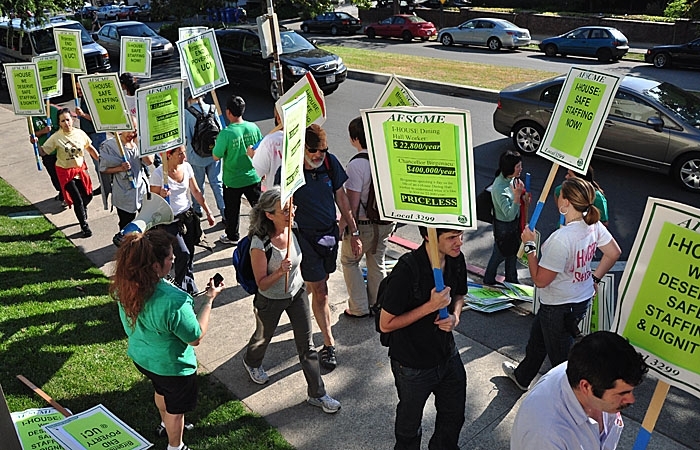 Picketers gathered in front of I-House Wednesday. Workers, union members, community members, UC Berkeley students and passersby gathered today in front of the International House to bring attention to the plight of the campus auxiliary's food service workers. Picketing on Piedmont Avenue with signs on street corners and medians, protesters - many wearing the green shade of the American Federation of State, County and Municipal Employees Local 3299 union - asked I-House Chair and UC Berkeley Chancellor Robert Birgeneau, who was attending I-House's 80th annual fundraising gala, to "spend a day in the life of a Berkeley service worker" to experience their workplace struggles. Workers and union leaders have charged I-House with attempts to break up the workers' union and also overworking employees. They demanded that I-House hire more career employees to replace less experienced and less efficient contracted or temporary workers. Unlike temporary workers, career employees would be eligible for university benefits. I-House representatives said in a statement that they have attempted to meet these demands and are in the process of hiring four new career workers to fill employment vacancies. Liz Perlman, a lead organizer for the union, said the vacancies I-House says it will fill are all for part-time cooks employed at 90, 70 and 60 percent time. The union has demanded that I-House hire eight full-time employees, including cooks and food service workers. "I'm always running, always under pressure," said Ramon Pizano, a food service worker who has been an I-House employee for 13 years. "It's too much for one person ... now I work double and am paid the same." Pizano carried pizza boxes labeled with his and other workers' names, their length of employment and take-home pay, which totals about $1,900 a month. Within the pizza boxes, pie charts detailed workers' monthly spending - for one worker, costs included $1,200 for rent and $500 for food as well as the number of children each worker supports. "I said ... I want to give this message to you," Pizano said when he recounted handing his pie charts to Birgeneau. "We are worried about the problems of every worker."